Drive Shaft Holding Tool 18mm. Installation and removal tool for use with Skat-Trak impellers on Yamaha 155 mm pumps. Aftermarket Kawasaki Cush / Damper for use with ATP Billet Drive Couplers. OEM Yamaha Pump Spacer/seal, fits behind the impeller. Aftermarket Pump Bearings & Seals full set. Billet Pump Cone for pump tuning. Billet Pump Cone for Solas pump tuning. OEM Kawasaki Cush / Damper for use with ATP Billet Drive Couplers. 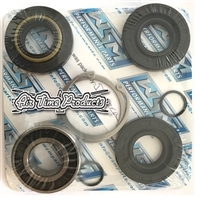 OEM Pump Bearings & Seals full set. ATP Billet Couplers- Lighter & stronger improves throttle/ crank rotation responsivness . OEM Yamaha Pump Duct - Pump shoe. Comes completely assembled with bearings, seals and circlips installed. If you suffer from salt bubbling your stainless steel liner, this is for you. Replaceable plastic insert-No more chewed up props ! 2008 Superjet to present 2017 Intake grate / Scoop Grate, highly recommended. 2008 Superjet to present 2017 Worx Rideplate.